In 1922, three men were so captivated with flying they leased 30 acres of cow pasture south of Moline to serve as a landing field. Other early aviators and barnstormers began using Franing Field, and it soon became known as Moline Airport. The field hosted the Ford Reliability Tour four times, served as part of the original New York to Dallas airmail route, had passenger service as early as 1927, became one of Illinois's largest Works Progress Administration projects, weathered financial struggles and a battle with neighboring Davenport, Iowa, over which community would possess the area's commercial airport, and has enjoyed constant growth and updates for both airline and general aviation traffic. 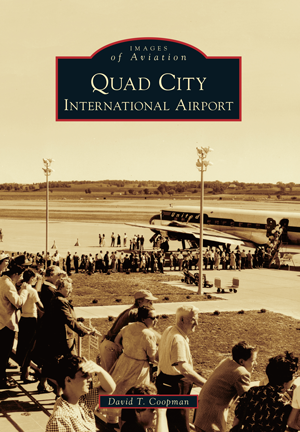 This collection of historical photographs and images will present the people, planes, events, and development of that former pastureland into today's modern Quad City International Airport, the third largest airport for passenger traffic in the state of Illinois. David T. Coopman is a former teacher, past president of the Rock Island County Historical Society, and a local history buff. He has authored two books on the history of local radio stations and two books in the Images of America series—Rock Island County and Davenport's WOC AM-FM-TV.